I though of starting with the basics of post processing, this is not how to take a photo, what background is best for a given subject or what composition is best for a given scene, this is meant to be a simple showcase of the tools available in imaging software and how they affect the image itself. I will NOT be explaining how 'light room' (same process as darkroom from film times, but for processing digital RAW data) works in this entry, I leave that for another time. I'll be using GIMP, it is a free application and give me quite some tools for enhancing my photos, I use some python Filters that I installed a long time ago, but for sake of compatibility I'll use only the most common ones than can be find on other imaging application. This is not a GIMP tutorial though, so you should know what/where tools are, names of tools don't change a lot from application to application, so this shouldn't be too troublesome. First we need to start with a photo... well ... I have a bunch of them so I'll just pick one at random. I like this shot, while it wasn't the best taken one, it provides a nice start point to show some post processing tools. Let's start with composing the shot... usually you should prevent this by correctly frame the photo when shooting, but sometimes, either because you didn't had the time to do it or you did not perceive the scene well, framing will not be as good as you wanted. I feel like this shot needs to be rotated to level those stairs with the picture frame, there is a rotate tool available, it allows you to rotate the image at any degree your want. In Gimp you can also overlay guide lines by dragging the ruler bar into the image itself. You may want to expand image canvas to fit layer size. I think I over did it a bit, well, this is only a simple tutorial with no artistic intentions. If you want more control over the image you can use perspective tool, it may prove useful to make something into perfect rectangle/square. Like this on the right. You can also use lens distortion/correction tools, some cameras correct it already. I solve to crop the photo quite a bit, this can be done by making a rectangle selection and choosing "Crop to selection", in my case I set the selection to have 3:2 proportions. At this point I feel that image needed to be sharpened a bit, I've done this using a special filter I have in GIMP, it is equivalent to unsharp mask filter in other applications with support for darkening and enlightening edges so that they 'pop up' more, giving the image those contrasty edges that are pleasant for the eyes while avoiding some artifact given by normal sharpening tools. However, over doing it will make the picture look artificial by casting auras/halos around edges in a similar fashion to what happens using normal sharpening filter. Using a large radius mask will give a bump in local contrast, if the strength of the filter is too much it may give some halos similar to those of HDR images, I feel this image could benefit from some slight improvement of local contrast, so here it goes, radius 64 with 0.5 strength. If your application can only lighten the edges (most do, photoshop and paint shop pro should have it working like the GIMP filter by now though), you can apply the filter to the normal image, invert the colors, apply it again, and invert to the original (you can test this by drawing a light gray rectangle on a dark gray background and applying the filter). Well, the picture has now a bit more contrast, however, in the picture the sun was setting, and it lacks the harsh light of the sunset, I wanted to enhance a bit that mood as a pretext to explain a bit the curves tool. This is probably one of the most basic curves you will use, understanding how to use curves tool requires you to understand what a image histogram is, I won't be explaining that here right now, but you can get an idea that it shows the amount of pixels at a given light level (if it is a luminance histogram). 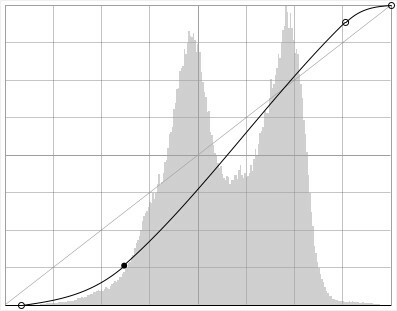 The light gray diagonal line shown the original curve, the black line shows my change. Clips the shadows a bit (by starting under the original line). A side effect of increasing the contrast is that it increases the saturation (color contrast) as well, this is because the curve is not applied to luminance alone but to Value channel, that can be seen as an average of RGB, this gives me a stronger orange/red tone on the stairs, thus increasing the idea of the sun light hitting the stairs there. I suggest you play with the curves tool, it can be very powerful to either correct the colors, enhance them or simply create surrealistic effect. Hope you liked this small showcase of post processing tools. Play with the tools you have on your application, if you are new to this and have Windows on your computer, I suggest Paint.NET as a starting point, it is free, simple and intuitive. If you like to see something more deeply explained feel free to ask.